The following Citysearch shill isn't a giveaway so much because of the wording— though the exclamation point is suspect—but because we know what Boucarou is like. This isn't it: "This is a great spot to go for a cocktails after work with colleagues or to meet up with friends. Great for conversation and nice atmosphere. Also, the menu was nice to order small plates. I had the fried calamari and salad maison and would have both again. My friend had the fries and they are amazing! I will definately be going back." 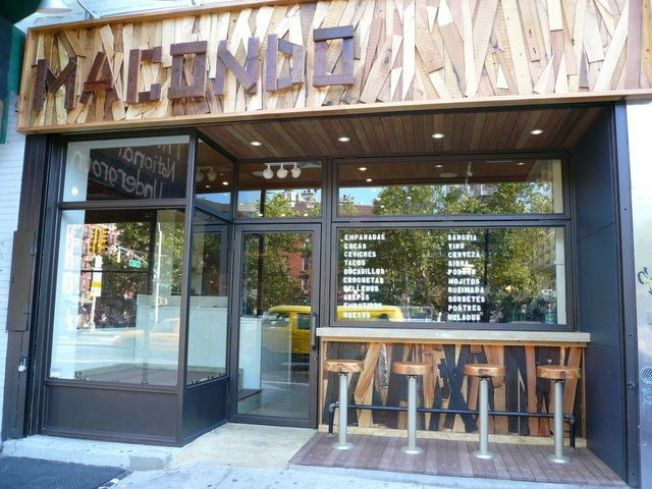 Some new suspicious Yelp reviews for Macondo: "First off...the patatas bravas are TO DIE FOR. They are amazing. So amazing that my mom and I had to go through to orders. haha. Anyways, I love the decor -- it's going for the simple/rustic look and although it can appear to be a bit contrived, I still find it to be cute. The back area has some nifty lights and palm trees. The bathrooms are fun too -- They have blackboard walls and chalk so you can scribble about when you're doing your business. haha....This is a great place to come on a date or even with a large group of friends. There are large tables that can accommodate 6-8 people. I was talking to one of the waiters and he said that the restaurant was looking to stay open even later -- to like 2 or 3 am." Citysearch has a fairly shilly five star review from a second time user for 508. Note the spelling of gnudi: "I just happened to walk by with my husband and see that the old Giorgione was newly reopened and is now called 508. It has new owners now, and the food was just fabulous when we went on thursday. We shared the octopus and the most tender pork belly, soooo good!! Then we tried the ravioli pasta (nudie??) and my husband splurged for the steak and it was gigantic and delicious! For dessert we had brownie and an interesting ice cream, I think it had rosemary in it, very different and I keep thinking about it. I recommend this place! Next I would try the lunch!" A couple of suspect raves for Forum, both by first time reviewers and posted on the same day: "I never write about my experiences online but I feel that I have too about how great Forum is. I decided to have my bday party dinner at Forum with 10 of my friends and let everyone else meet us there later. To avoid the headache of multiple venues I thought this would easiest. Although I was not expecting the best food in my life I was wrong. The food was DELICIOUS!...After dinner was complete (which I cant stress how good it was) we moved into party gear."